After one of the more surprising and strange defeats in recent Seahawks’ history, Seattle players insisted they wouldn’t be caught pointing fingers at any of the more obvious targets of potential blame. Observers, though, are tempted to suggest that the way things went Sunday maybe that’s because if they did point fingers they would likely miss their target. Indeed, while kicker Blair Walsh’s struggles figure to most define this game — he missed field goals of 44, 39 and 49 yards in the first half, all wide left — few areas of the team emerged free of criticism. Seattle had a season-high 16 penalties for 138 yards with all five offensive linemen getting at least one. It was the fourth time in the past six games Seattle had 10 or more penalties and gave the Seahawks 82 for the season — nine more than any other NFL team — compelling Carroll to admit it’s becoming a big problem. “We’ve had enough penalties already in this season where you could say one of these games it’s going to jump up and bite you and that’s exactly what it felt like today,’’ he said. “It’s really important that we find our way and find our way back and play good football. That was a bad day for us. I totally feel responsible for that. I don’t see anything other than that. I have to keep these guys from making penalties. I have to get it done.’’ Seattle, in fact, is on pace for 164 penalties — the NFL record for a season is 163 by the Raiders in 2011 — with Sunday’s 16 the second-most in a game in team history (Seattle had 17 against Green Bay in 1984). The offense, while gaining 437 yards, once again had trouble converting yards into points, getting inside the red zone just twice. Part of that was due to converting just five of 14 times on third down as well as all the flags (10 were against the offense). Quarterback Russell Wilson, so electric the week before in throwing for a team-record 452 yards, was more erratic against Washington, completing just 24 of 45 passes for 297 yards with two interceptions and a third on a two-point conversion attempt. The defense, while providing Seattle’s only points in the first three quarters on a safety and sacking Washington quarterback Kirk Cousins a season-high six times — albeit, feasting on a Washington offensive line missing four starters — gave up a shocking drive after the Seahawks scored on a Wilson-to-Baldwin 30-yard pass with 1:34 left to go up 14-10. 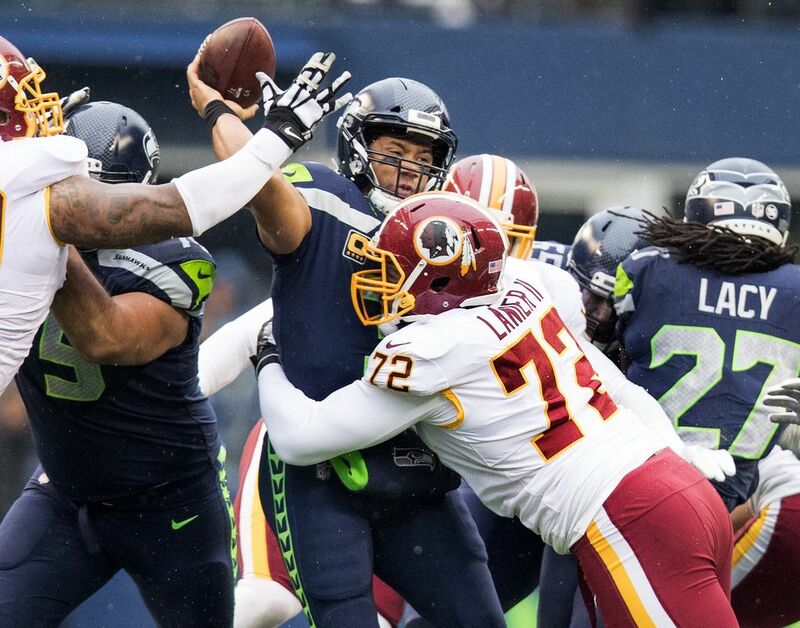 In the kind of situation in which Seattle usually gets a sack or two to end the game, the Seahawks instead gave up a four-play, 70-yard drive on which Cousins completed passes of 31 and 38 yards, the latter when Josh Doctson beat rookie Shaquill Griffin in man coverage down the sideline and made a sliding catch that took the ball to the 1. Cousins said he changed the play call at the line when he saw Griffin in press man coverage. “I put it out there and he went and got it,’’ Cousins said. And while the defense held Washington to 244 yards, Seattle also dropped two interceptions. “We had a chance to take that game and we didn’t do it,’’ Carroll said. And, of course, there was Walsh, signed as a free agent in February to a one-year, $1.1 million deal when Seattle realized it would unlikely want to match offers for longtime kicker Stephen Hauschka, who eventually signed a three-year contract worth more almost $9 million with Buffalo. Walsh, whose Minnesota tenure began to go off track when he missed a 27-yarder that could have beat Seattle in the wild-card round following the 2015 season and was released last November, was 12 for 13 on field-goal attempts with the Seahawks before Sunday. Carroll said he thought Walsh seemed a little off in the pregame when trying to account for the elements — the wind was officially listed at 11 miles an hour. Some of the best defense played by the Seahawks came in the locker room afterward as players resisted taking any media bait and laying the blame on Walsh. Carroll said he did, too, and was hoping Walsh might get a final chance to tie it. After Washington’s surprisingly quick touchdown march, Seattle had 59 seconds left to try to tie or win it, and it looked doable when Wilson hit Paul Richardson to the Washington 38 with 15 seconds left. But on the next play, Wilson was sacked by Terrell McClain, trying in vain to get rid of the ball before his knee hit the ground. Seattle appeared to benefit from the confusion that followed as the clock stopped and then the play was reviewed. The sack, though, moved the ball too far back for a field goal — from there it would have been 64 yards. “If we had a shot, I was totally counting on him to kick the game-winner,’’ Carroll said. Seattle’s last gasp was a Hail Mary in the direction of Jimmy Graham and Tanner McEvoy that after a brief blip of hope fell incomplete. When it did, it snapped Seattle’s four-game winning streak and dropped the Seahawks to 5-3 with what was just their seventh home loss since Wilson became the QB in 2011, and also caused them to fall into second place in the NFC West behind the 6-2 Rams. Any wallowing in frustration, though, won’t last long as Seattle gets back to work Monday in preparation for a Thursday night game at Arizona that suddenly looms far more pivotal than anyone could have imagined when the day began.